There are some earlier reports that Google Page Rank update is on its way, it’s too early to say its an official page rank update but still many newly established popular blogs like SEM (SmartEarningMethods.com) have got a page rank of 2 from 0 which confirms that 3 may is the official date for the second page rank update of the year 2012. The first page rank update of this year was arrived on 6th February 2012 as Google update page ranks with the gap of 3 months. 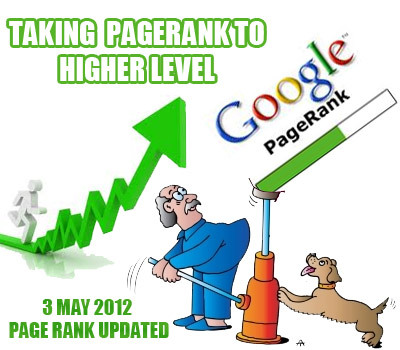 These page rank updates are very important for webmasters and bloggers as it indicates the quality of a website. PageRank is a mathematical algorithm which is used by Google to calculation the popularity of a certain page. The calculation of a page depends upon numerous factors such as, Number of backlinks, number of outbound links, attention of audience and etc although Google doesn’t shares the lethal information about the process of PageRank algorithm but many unofficial sources confirms it is entirely based on quality. There are many articles all across the internet which cover the importance of Google PageRank but none of the talks is confirmed by Google Inc. Important: If you don't saw any change in your Page Rank don't worry the Update is still under progress it will be updated soon. As we all know Page rank has nothing to do with Search engine optimization basically it is the fruit for the bloggers hard work. It is the motivation for webmasters and bloggers to keep on doing what they are good at. Google had confirmed many times that webmasters and bloggers don’t need to worry about their page rank as it doesn’t affect search engine ranking or traffic. But still PageRank has some significance as most of advertising companies looks for those websites which have high PageRank. Google provides the basic information that Page Rank depends heavily on backlinks. Never believe the expected dates they are not confirmed. They will only give you the idea on which month an update is expected. There’re uncountable tools available on internet which allow us to check our page rank. I used couple of tools to check the update but if you are using Google Chrome I highly recommend you to use this (Page Rank Plugin For Chrome) it has easy to use interface with one click installation and whenever we will visit any website it will automatically fetch all the data and will show you the page rank. Sharing my personal views, I really like page rank updates it does brings joy for every blogger as it the fruits of our hard work and determination towards blogging. It indicates how well we are managing our blog if we saw a down fall in our blog Page Rank then we need to work hard, but if it remained the same then we are going in correct direction. So give your thoughts about the page rank update? What about you page rank? Share your views, till then peace blessings and happy updating. Any Chances To Get Pagerank In 1-2 days? Yeah! we have seen our Pagerank update. However, my blog home page's pagerank remain unchanged but our internal pages got new pagerank from 2 to 3. Cheers you! Thanks for shairing nice info with us Dear. I hope you will give us all the latest updates realted to page rank and algo etc. Thanks A log Again...!!! !